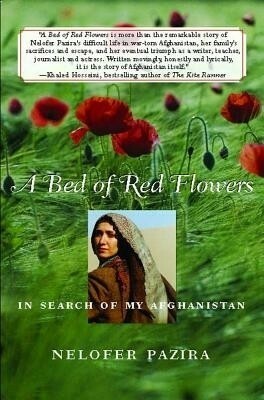 I recently finished reading A Bed of Red Flowers : In Search of My Afghanistan, and I was deeply moved by this book. This book is written by Nelofer Pazira who lived for ten years under the Soviet occupation in Afghanistan, escaped to Pakistan and emigrated to Canada from there. The book is her story about growing up in Afghanistan, and I can’t recall reading anything sadder or more powerful in recent times. What strikes me most about her story is the drastic change that has come about in Afghanistan in just thirty or forty years, and how some parts of the story are so relatable because we have all experienced 9/11 and its after effects, but other parts of the story shock you, and surprise you. For instance, at one point in the story Nelofer Pazira speaks about how her father saw her mother the very first time, and how she was wearing a mini skirt at the time. I was frankly quite surprised at that because I never knew Afghan society was like that at any point in history. I think a lot of us assume that Afghanistan was always the way we are used to seeing it now, but that is far from the truth. The book does a great job of presenting this contrast and giving you a good history lesson about Afghanistan written in a beautiful manner. I will quote a couple of passages from the book to show what I mean. The first one is the passage I referred to earlier. My father still fondly recounts their first meeting as if it were yesterday, his story like a script from a romantic movie. A young woman with long blonde hair, dressed in a miniskirt with a stylish sweater over her shoulders, smiled at him, and Habibullah’s heart was bound up with the ringlets of her hair—as he made clear in a verse he composed to mark the occasion. The second is a passage from the time of the Taliban occupation, and reading that just leaves you aghast. What happened in Afghanistan is a tragedy, and one that is usually viewed from the events of 9/11 and after. This book is a great story about the Afghanistan that existed before Taliban, and also of a young girl and her family that suffered through all of this. The other thing that strikes me about the book is the author’s love for her country, and her childhood friend who she has to leave behind in Afghanistan. The stories of individual atrocities fill you with horror, but there is a sadness in the words that don’t describe an atrocity but just the passage of time and change in the course of lives of the characters. It is hard for me to describe this but you develop such an empathy with the characters in the book knowing that they are all real and have suffered through this that it has the powerful effect of making you stop and think about how those people must have felt like how the author would have felt when she didn’t receive a letter back from her friend, what were her fears, what did she do to overcome them, what was her friend thinking, was she saddened by the fact that someone was waiting to hear from her and could not. It is all very powerful. Nelofer Pazira also actually travels back to Afghanistan in search of her childhood friend, and there is a movie called Kandahar which is inspired by this. The move is quite popular apparently, but I didn’t know about it, and have still not seen it. All in all, A Bed of Red Flowers is a great book, and I would definitely recommend it to all of you except the ones who think they may not be able to handle the sadness that the book will fill you with. Seems very good. Assume you have read Persepolis which is less sadder but similar take on Iran. Iran again a very liberal society(having met Iranians know) but completely messed up by West and misportrayed. No I haven’t read it, that will be next in my list, I have started reading Do Androids Dream of Electric sheep which is quite fascinating as well.